94.7 KMET. Los Angeles. The Mighty Met Jingles and Videos. Home 94.7 KMET. Los Angeles. The Mighty Met. 94.7 KMET. Los Angeles. The Mighty Met. 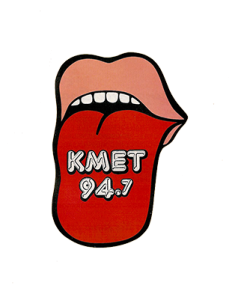 KMET was a Los Angeles FM radio station owned by Metromedia (hence the “MET” in its call sign) that broadcast at 94.7 MHz, beginning in June 1968. It signed off on February 14, 1987. The station, nicknamed “The Mighty Met” (among other nicknames), was a pioneering station of the “underground” progressive rock format. Some of the jingles from the late 70s through the 80s. KMET - A little bit of heaven 94.7 KMET Tweedldee WHOAA!